"Alleras would make a maester. He had only been at the Citadel for a year, yet already he had forged three links of his maester’s chain. Armen might have more, but each of his had taken him a year to earn. Still, he would make a maester too. Roone and Mollander remained pink-necked novices, but Roone was very young and Mollander preferred drinking to reading." “He told me that a maester’s collar is made of chain to remind him that he is sworn to serve ....A maester forges his chain with study, he told me. The different metals are each a different kind of learning, gold for the study of money and accounts, silver for healing, iron for warcraft"
In order to earn sufficient links to call oneself a 'maester', it seems likely that you would need to study as an apprentice for around 10 years but potentially up to 20 before you are awarded the title. This is borne out by the advanced ages of the vast majority of maesters seen as well as our own contemporary understanding of the time needed to achieve multiple doctorates. 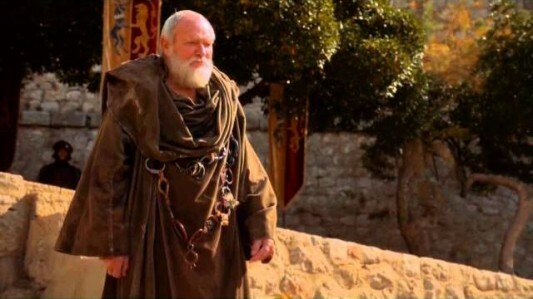 From the TV series, we can see that the chains seem to contain approximately 20 links and from a quote from GRRM we know that maesters can be awarded multiple links of the same metal if they are especially proficient in a particular area of knowledge. This suggests that a maester never finishes learning or earning links. Mulitple links are possible, and signify that the maester is especially accomplished in that area. Certain links, such as ravenry can only be awarded by an "Archmaester" whereas other links can be granted by the mutual assent of other maesters or presumably even be self-awarded. Some links such as Black Steel (Ravenry), Copper (History), Silver (Medicine), Pewter (unknown) and Bronze (Astronomy) seem common and relatively easy to attain since they're held by first and second-year students. Others such as Gold (Economics), Iron (Warfare) and Electrum (unknown) are particularly rare and seem to mark the passage into becoming a full-fledged Maester. Valyrian Steel links (for the study of Magic + the Occult) are exceedingly rare and held by less than one Maester in a hundred. Ironically, they aren't seen as especially prestigious but rather viewed with suspicion. Luwin slid a finger up under his collar and began to turn it, inch by inch. He had a thick neck for a small man, and the chain was tight, but a few pulls had it all the way around. "This is Valyrian steel," he said when the link of dark grey metal lay against the apple of his throat. "Only one maester in a hundred wears such a link. This signifies that I have studied what the Citadel calls the higher mysteries—magic, for want of a better word. A fascinating pursuit, but of small use, which is why so few maesters trouble themselves with it. Presumably it would take a few years, although I do not recall a specific time being mentioned at any point in the series. The actual length of time seems to depend upon each individual student. For what it's worth, it is mentioned in the AFFC Prologue that Pate has been at the Citadel for five years but has failed to earn a link. On the other hand, Alleras has been there for a year and has already forged three links. I'd imagine that the chain is somewhat similar to the 'badges' that scouts earn. Once you master one thing, you get the link which signifies that you're (at least) competent in that area. I'd also speculate that maesters never really finish adding links . . . I have to add that Cressen's replacement is stated to only be 25 years old and was very recently sent to Dragonstone as of Clash. Training probably usually starts when a boy is a man grown at 16 (give or take a few years). So I'd say an average of between 10-15 years. Can a maester's chain include multiple links of the same metal? How do maesters wear a chain when it only has one link? How much Valyrian steel is there that is unused for link making and why aren't people making weapons out of it? When was the last winter? How do genetics work in Game of Thrones? How did Ellaria Sand and the Sand Snakes take over Dorne? Was Craster conceived or born around the time Bloodraven was at the wall?